Try to reinstall just the launcher if u r using it. After that u can try a restart of ur computer and see. If none of these work then check if any windows updates needs to be get done, if so then do it and restart pc. It's not frustrating to run the mod, it requires literally 10 seconds: unzip the archive in D2 installation folder and it's done. Ready to go. What's frustrating it's running it in conjunction with outdated third party softwares not even developed by MXL devs. Probably the better wording, thats true, I just did it out of habit. I followed the instructions, I think I will just try again or try to run it without D2SE. 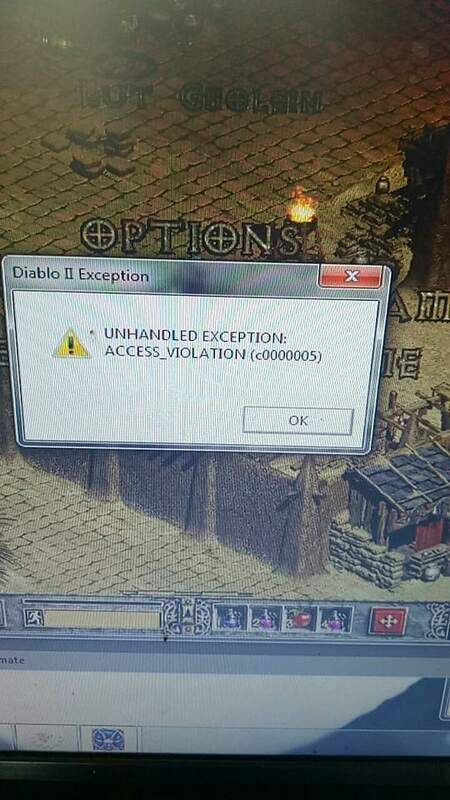 Hey guys, I’m seeing a lot of problems with the unhandled exception error. First, it happened when going from Act 1 to Act 2, but I somehow fixed that. Now the issue pops up again when I go into the portal after Meph in Act 3 to get to Act 4. I’ve done pretty much everything this topic said to do and it’s still happening. Kinda frustrated how many times I’ve had to reintall everything...just to hit a break wall further down the road in the later acts when I’ve already sunk a couple hours gameplay into a character. are you playing full screen or window mode ? it might have somethig to do with the cinematics that start at the end of each act or with the music . try playing in window mode (cinematics are disabled that way) and turn off the music (" ctrl + m " iirc) , go kill an act boss and proceed to the next act to see if it fixed your problem . ChuckNoRis wrote: are you playing full screen or window mode ? it might have somethig to do with the cinematics that start at the end of each act or with the music . I think this is how I fixed the error the first time going from Act 1 to Act 2, I had to reinstall only the multiplayer option for D2, not full. Now whenever I proceed to the next act it prompts me for the cinematics CD which I just cancel. I’m not sure why this time for Act 3 to 4 is different. Even when I play in windowed mode with music turned off it gives me the error. it sounds like your instalation is somehow still screwed . no matter how many times you reinstall , if you always do the same steps as you did untill now it will still cause errors untill the instalation will be done properly . there's something you're not doing right . are you using a legit cd key or is it a pirated version that has a different way of installing ? Do a clean install outside of c: /program files/ Do the full install ! If you are using MLX Luncher, be sure to uncheck "disable in-game sound"
If you dont want amy music/sound just turn them off manually when you are in game. Also if you are playing on realm u can use ctrl+m while you are in chat. It disable the sound of chat like sound of clicking on buttons ect.